Since Saigo Elementary School is located in the city of Toyohashi with a population of 360,000, I thought I would be visiting a large urban school. I was quite surprised when the principal Mr. Ito drove me about a half hour from the train station to a rather remote rural area. Almost all of the 200 students walk about one hour each way to and from school. 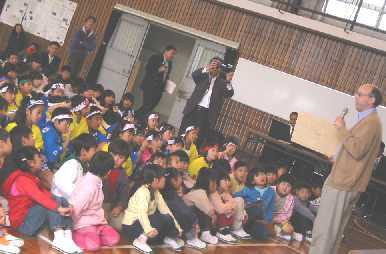 My visit to the school was quite comfortable, with extra-large slippers waiting at the front entrance upon my arrival. My day started with a chat with the principal and several members of the Koneta Group, named after the school's Blue-eyed Doll Koneta. This group of local citizens actively supports activities related to Koneta and the Blue-eyed Dolls. They provided me with much interesting information about Koneta, which I hope to be able to add soon to the Friendship Dolls web site. The group also presented to me a beautifully decorated hagoita (wooden paddle traditionally used in New Year's game similar to badminton) and a sack of locally-grown persimmons. I was quite surprised to find out that there are actually three Koneta dolls, the original one received from America in 1927 and two replicas. The original is kept in the principal's office. One of the replicas of Koneta is displayed at the front entrance to the school, and the other replica was given by the school to Northridge Elementary School in Wapakoneta, Ohio. The principal's office contains many items, including other dolls, that show that Saigo and Northridge Elementary Schools have an active intercultural exchange. During the third period I visited each of the classes to observe the activities. 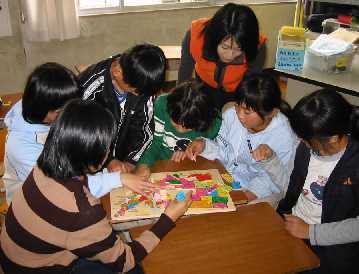 In the third-grade class, the students were learning how to write Japanese words using romaji (English letters). 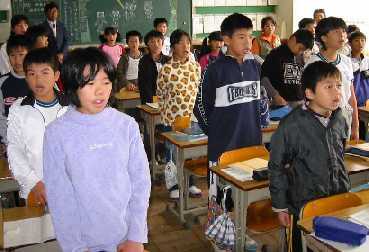 When I wrote "subarashii kodomotachi" ("great children") on the blackboard, it took the students a few seconds before they could figure out the meaning since the words they had been practicing were much shorter. 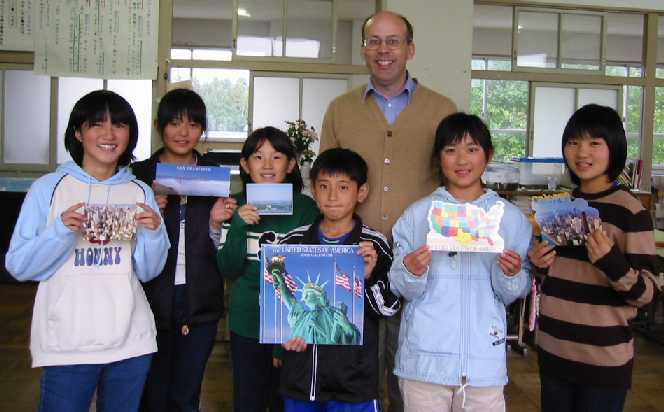 The fourth-grade students greeted me with both the English and Japanese versions of "Country Road" by John Denver. They were surprised to hear that over 25 years ago I went to a concert by the singer who wrote this song. The welcome ceremony attended by all of the students began with the playing of the national anthems of the United States and Japan. 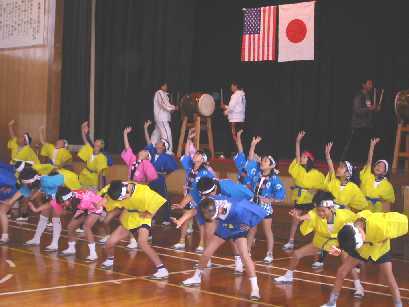 The students then sang "Sakura" (Cherry Blossoms), and the younger students did a traditional Japanese dance accompanied by taiko drums. I gave a brief talk and then answered questions from the students. One girl said she liked Koneta's eyes the most and wondered what I liked most about the doll. I replied that I thought her stylish coat was her best feature. In response to a question as to how I first became interested in the Blue-eyed Dolls, I explained how impressed I was when I first saw a Blue-eyed Doll last summer at an Education Museum in Matsumoto while on vacation with my wife. I was surprised to see how much the Japanese people treasured a regular American doll given over 70 years ago. At the end of the ceremony, a couple of students presented me with some art work made by some students at the school. I then ate lunch with the second-grade class. They had many questions for me, so it was a challenge eating lunch and answering their questions at the same time. One question I could not answer was my blood type, which all Japanese people seem to know. I remember determining my blood type in junior high school science class, but I have long since forgotten it, not thinking it was that important to remember. 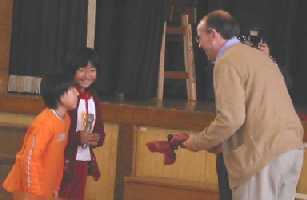 Although my "official" schedule indicated I would depart after lunch, I was happy when I was invited to meet with the English Club by the second-grade teacher, who is also the teacher for the English Club. I had a chance to show the six students in the club many items, such as American stamps, post cards, and coins. When I asked them to select which of four cities they liked best based on the post cards, the largest number of students selected Chicago over New York, San Francisco, and Washington, D.C. At the end of the meeting time they enjoyed making a US states puzzle.